The Manchester Arena bomb was a terrible event and Simon Cooper, a member of the Oldham Ward, decided to do something to aid the victims. Simon is a professional football coach at Oldham Athletic, and lives and breathes football, after turning his life around ten years ago and coming back to the Church. With the help of his team of “redcaps” plus his ever-supporting wife Mandy, he organised a twenty-four hour football marathon with teams from all over the country, held at Curzon Vale in Ashton under Lyne on June 2nd 2017. At least one match at any one time was being played throughout the 24 hours. Paul Scholes officially opened the marathon and Tony Croller the boxer closed it. The effort raised an amazing £43,000 that was handed to the Red Cross. 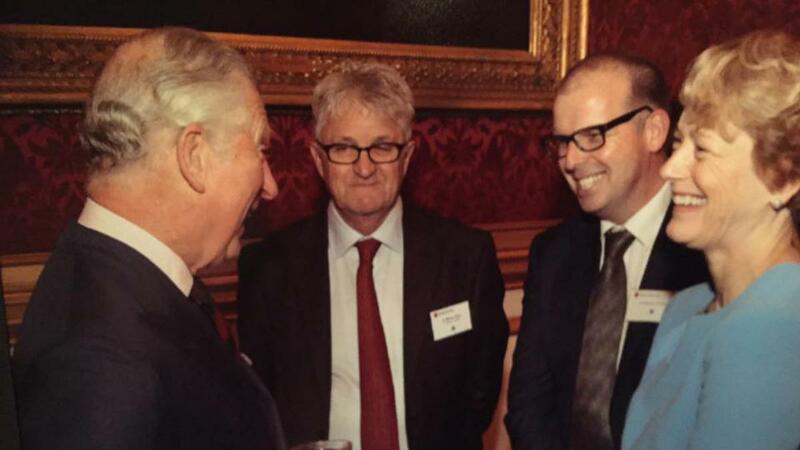 Simon was invited by the Red Cross to meet Prince Charles at St James Palace, in November 2017, which he was excited about. A week later at an annual FA Grassroots event, Simon sat with his wife Mandy and some friends enjoying the evening and anticipating the “unsung heroes” award at 10pm. At 8pm the announcer stated that they were about to honour an exceptional person with a special award. It got everyone’s attention then to Simon’s surprise his face appeared on the screen along with some of his redcaps. He was very emotional when his name was called out, and as he worked his way to the stage, many people jumped up hugged him and patted him on the back. In his thank you speech, he emphasized that it was a team effort, thanked his redcaps, and thanked the people of Manchester for their great contributions after the bombing, and stated, “This is what we do”. Simon’s speech got a standing ovation and many cheers; he was then presented a special trophy for outstanding achievement.